You’re getting married, congratulations! There are so many things to be considered during the wedding planning process. Your wedding to-do list may include: picking the venue, the dress, your bridesmaids, food, the guest list, and the flowers! From start to finish, planning your wedding is highly personal and you should choose things that make you happy and that are appealing to you! For example, do you have a favorite flower? A favorite scent? Will your wedding be at in your backyard or away? Perhaps this will be the reasoning behind your chosen wedding floral arrangements. However, if you don’t have any idea of the types of flowers you’d like to have, consider the following. There are so many magazines, online resources, and gardens available to begin your search for the perfect wedding flowers. There are also many talented and reputable florists who can recommend floral arrangements based on your personal preferences, style, and the season! Lilacs are a popular wedding flower, for example, but, it’s only in season for 3 weeks out the year in Spring. The season definitely impacts your flower choice (especially if you’re working with a tight budget!). A good florist can give you a full list of what flowers are available for your wedding whether you’re getting married in the summer or winter. The bridal bouquet is the most important floral decision you will have to make. It needs to be a show stopper, the most spectacular bouquet in the wedding, it is your special day after all. Once again, the flowers for the bridal bouquet depend on what you want. It is highly recommended not to finalize this arrangement until you have chosen your wedding dress so that the two match perfectly. Once you have decided on your bouquet you will have to decide what you would like your bridesmaids to have. 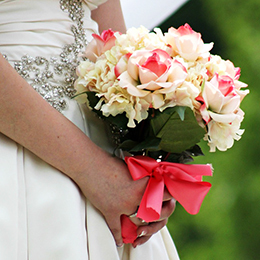 Many brides will opt to have the bridal party carry smaller versions of her bridal bouquet. Your chosen florist can also assist with flower shapes, colors and embellishments (crystals, pearls, etc) that will make your bridal party bouquets unique and memorable. According to the wedding website, TheKnot.Com, some of the most popular wedding flowers are tulips, lilies, hydrangeas, peonies, sweet peas, gardenias and roses. Hopefully, this list will help you narrow down your bouquet and centerpiece choices before you meet with your florist. Or, if you want to stray away from what everyone else picks, this could be a list of flowers that you want to avoid at your wedding. If you have a white wedding dress then your flower choices are endless and can be based entirely on personal preference. Everyone loves the sight and smell of beautiful flowers, and they can provide a unique and personalized touch to your wedding decorations and bridal party. To save you time (and money) speak to your local florist about your budget, the date of the wedding, color choices, flower arrangement likes and dislikes and let an expert show you the options that you can work with. A wedding wouldn’t be a wedding without flowers (no matter what the season! ).